While I have had many photos published in my hometown’s local paper, this month marks the first time I have had one of my photos in a regional publication. The New York State Department of Environmental Conservation publishes a bi-monthly magazine called The Conservationist which has a circulation of about 90,000. I was contacted by them about a photo I took a couple of years ago when I visited Lake George, New York and explored Prospect Mountain. 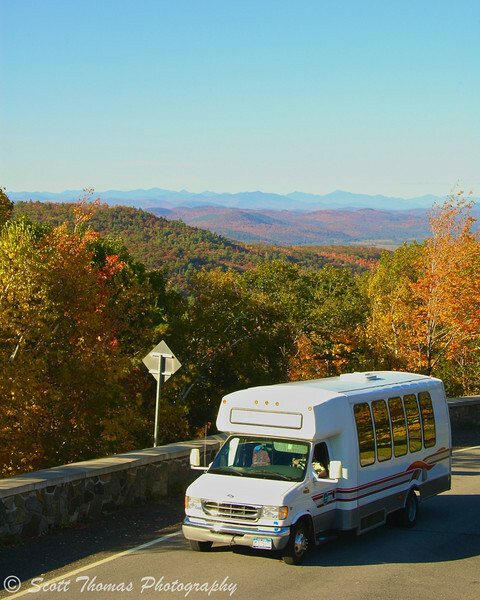 The article is a personal account of past visits to Prospect Mountain, especially in the autumn to see the beautiful fall colors. For those who may be interested, check out my catalog at IthacaStock.com which have very reasonable rates for all your stock photography needs. Below is one of two photos of mine chosen to accompany the article. The photo was taken with a Nikon D70 and 18-200VR lens. One does not need expensive equipment to create photos publishers will need and use. This entry was posted in Photography, Travel and tagged autumn, colors, dec, fall, high peaks, ithacastock.com, lake george, magazine, new york, prospect mountain, published, shuttle, stock, the conservationist, viewmobile. Bookmark the permalink. Yep, that was one beautiful fall and a perfect weekend in Lake George. It is a good picture. No wonder they picked it for the article. I clicked your link and saw the article. The two persons taking a view over the landscape gives a good feeling of the scale. It gives a good feeling knowing that others like your work. Yes it does, Carsten. Thank you for checking out the article, too. The photo with the people is actually the one that peaked their interest. How awesome for you Scott! Congratulations! Where did the publishers originally see your work that caused them to contact you? woohoo! Its a great shot, too. Great equipment is a relative term but a good eye…well, you know one when you see one. hehehe…no pun intended. Look at all the early birds! And we’re all singing the same song! This is great, Scott. And the photos do work very well with the story. Thanks, Gerry. I am enjoying the song! How wonderful, congratulations! I understand why your photo was chosen, it both shows a wide view and a useful information of how this fantastic view can be seen. My family sometimes looks at me funny when I am taking pictures of things that don’t look interesting. One never knows what someone might need. I took photos of oil rigs out west. Not the prettiest things but could be useful for someone writing about oil production or the impact of oil drilling. Congratulation Scott, they picked a good set of photos for their article. The leaves start to change colors in our area, but not as pretty as the view in your photos. Thank you, Nye! The leaves were gorgeous that year. Not so much the last two. Congrats! It is a lovely photo. I love the colors and how the leaves are reflected in the vehicles windows.